The hyperinsulinism/hyperammonemia (HI/HA) syndrome is the second most common form of congenital hyperinsulinism (HI). Children affected by this syndrome have both fasting and protein sensitive hypoglycemia combined with persistently elevated ammonia levels. Gain of function mutations in the mitochondrial enzyme glutamate dehydrogenase (GDH) are responsible for the HI/HA syndrome. GDH is expressed in liver, kidney, brain, and pancreatic beta-cells. Patients with the HI/HA syndrome have an increased frequency of generalized seizures, especially absence-type seizures, in the absence of hypoglycemia. The hypoglycemia of the HI/HA syndrome is well controlled with diazoxide, a KATP channel agonist. GDH has also been implicated in another form of HI, short-chain 3-hydroxyacyl-CoA dehydrogenase (SCHAD) deficiency associated HI. The HI/HA syndrome provides a rare example of an inborn error of intermediary metabolism in which the effect of the mutation on enzyme activity is a gain of function. 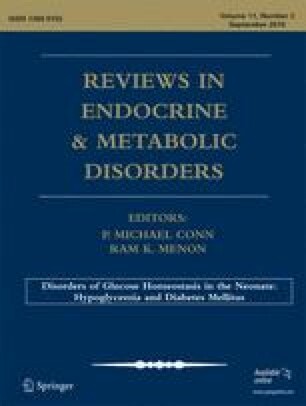 This work was supported in part by grants from the NIH (UL1 RR024134, RO1 DK 56268, RO1 DK 53012 to CAS) and from the Society for Inherited Metabolic Disorders.